Space is a concept that is central to geographical thinking. Yet,relatively little attention has been given to exploration of the concept of space as such, and this is so outside of geography no less than within it. 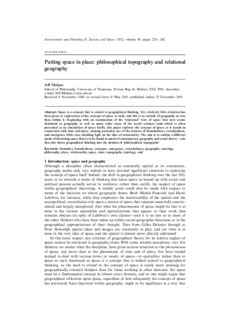 Beginning with an examination of the 'relational' view of space that now seems dominant in geography as well as many other areas of the social sciences (and which is often presented as an elucidation of space itself), this paper explores the concept of space as it stands in connection with time and place, making particular use of the notions of boundedness, extendedness, and emergence while also shedding light on the idea of relationality. The aim is to outline a different mode of theorizing space than is to be found in much contemporary geography and social theory - one that also draws geographical thinking into the domain of 'philosophical topography'.